ImTOO WMV 3GP Converter is an outstanding WMV to 3GP converter and 3GP to WMV converter that can convert video between WMV and 3GP format. And it can also extract audio from video to WMA file. ImTOO WMV 3GP Converter can convert videos from 3GP to WMV and from WMV to 3GP format which is working well with Nokia, Motorola, Samsung, Sony Ericsson, and so on. As a customer-oriented WMV 3GP converter, it provides rich functions such as splitting file, converting any video clips, calculating bit rate, and so on. Enjoy your favorite videos on mobile phone by converting video WMV to mobile phone compatible video format - 3GP. 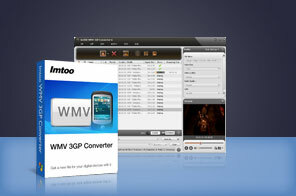 ImTOO WMV 3GP Converter supports converting not only WMV to 3GP video, but also 3GP video to WMV. Convert WMV and 3GP video to WMA audio file. Provide the fastest converting speed as it fully supports dual core or multi-core CPU. The WMV 3GP converter can convert more than one WMV and 3GP file at a time with just one click. Split a WMV or 3GP file into multiple clips by the split time or file size to better fit on your devices. Directly convert any video segment by the specified start time and duration, rather than the whole video. "Add Profiles" function means you can output multiple WMV and 3GP video files for one source file. The Bitrate Calculator enables you to get the output file size you prefer along with the bit rate calculated instantly. Fine-tune video and audio parameters you want, such as bit rate, frame rate, sample rate, codec and quality. The WMV 3GP converter can work in the background to finish the conversion so as to use other programs while converting. The conversion-done actions will eliminate the need of your waiting for the conversion to the end. Take a snapshot of your desired movie images while previewing and save them as JPG, PNG, GIF or BMP format. Tutorial : How to convert WMV to and from 3GP video with ImTOO WMV 3GP Converter? Convert various video files to 3GP video and audio files directly. Convert DVD to 3GP, AVI, MPEG, MP4, etc. video for your mobile phones. How to convert VOB to WMV, AVI? How to convert VOB to MOV (.vob to .mov)? How to convert WMV to AVI (.wmv to .avi)? How to watch 3D movies at home? How to make 3D movie (Anaglyph 3D, Side-by-Side 3D, Top and Bottom 3D) from 2D video?